2017 has been a year of preparing for change at Wheatbelt NRM, spurred on by both changes in State Government and a Federal election, as well as the implementation and uncertainty of National Landcare Programme Phase 2 (NLP2). An amazing amount of effort has gone into putting forward the position of the Wheatbelt to the various decision-makers to create opportunity. In the second year of the current 3 year plan (2015 – 2018), NRM is still testing strengths with the ambitious target of involving 25% of Wheatbelt residents or 100,000 members actively engaged in Environmental Management throughout the Wheatbelt. As NLP1 wraps up, Wheatbelt NRM has been taking the time to celebrate and acknowledge the successes in our Wheatbelt NRM community. Rob Boase, as the State’s 2017 WA Individual Landcarer of the Year, projects showing the outcomes of the efforts with improved bushland regeneration, plus advances in sustainable agricultural practices. Even increasing community engagement within all areas of the Avon River catchment, reaching close to 2500 associate members. Wheatbelt NRM is engaged in an environmentally significant program, working with the Yealering and Katanning communities to improve the water quality of their beloved recreation hubs, through the Living Lakes Project, supported by Royalties for Regions. At the project level, 2016/17 was a results year. We wrapped up 277 contracts with land managers’ delivery outcomes on ground – it’s that joyous moment where you can see the before and after photos that clearly show why we come to work every day. In 2018, we will just keep working to deliver the strategy for this community to have “a healthy environment that has a viable agricultural industry and retains a strong sense of place”. With this in mind, Wheatbelt NRM has just wrapped up an extensive round of community consultation in preparation for applying for the Regional Land Partnership and developing our internal work plan for the coming years. The Wheatbelt landscape is mostly privately owned. In order to have a positive impact on the natural resources in our region we need to engage the community who manages them. We want our projects to best reflect the will of our community. The National Landcare Program Phase 2 limits investment in the first two areas, so we will not submit projects to address the community’s greatest concerns. Projects will be submitted to tackle soil health, biodiversity and vegetation decline, biosecurity and feral management and farm sustainability. Please view the YourSay platform https://oursay.org/wheatbelt/your-say-project-voting-1/tab/most-voted#questions to see all of the projects and the community conversations around them. In the coming year, Wheatbelt NRM will develop a bid for the Regional Land Partnerships that best aligns the community’s need within the funding parameters. We will then continue to work with partners to bring in the resources to deliver on the community’s strategy. 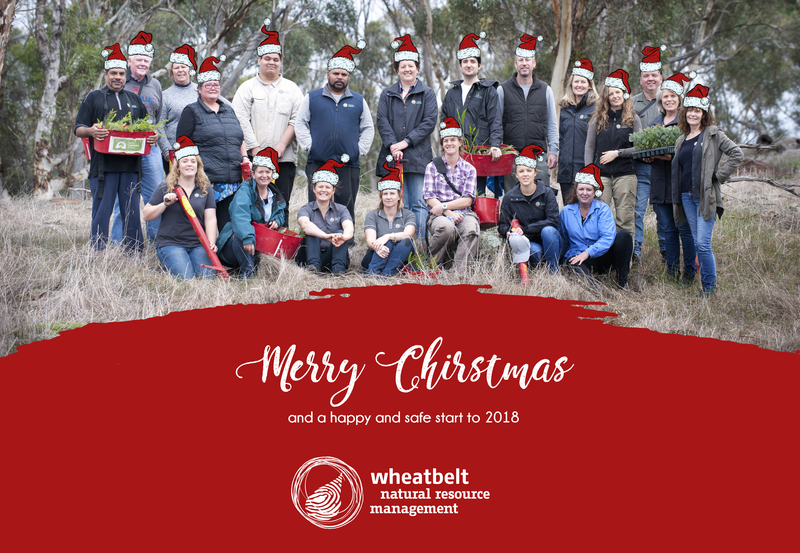 We look forward to communicating and working together to achieve much in 2018 through Wheatbelt NRM’s initiatives and from all of us, we wish you a Merry Christmas and a prosperous New Year.